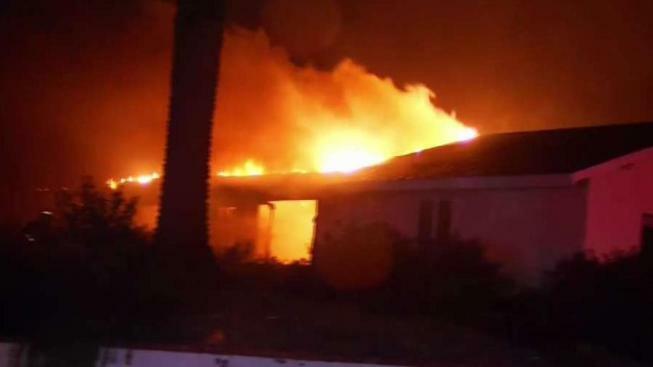 Kim Kardashian was forced to leave her home Thursday night after a wildfire started spreading in California. The "Keeping Up With the Kardashians" star was just returning from a trip when she saw the flames from the window of her private plane. Once she touched down, she had to quickly gather her belongings and head to safer grounds. "Pray for Calabasas," she wrote on Instagram. "Just landed back home and had 1 hour to pack up &evacuate our home. I pray everyone is safe." "Firefighters are arriving," she wrote in another post. "Thank you for all that you do for us." The reality star was able to flee the scene quickly. "They are evacuating everyone right now from all of her homes," she said in a video of her heading out in her car. The voice of one of her three children could also be heard in the background. Kardashian wasn't the only celebrity forced to evacuate. Kourtney Kardashian also shared a post of her loading up her car and leaving her home. Actress Alyssa Milano was forced to evacuate as well. "I just had to evacuate my home from the fires," she wrote on Twitter. "I took my kids, dogs, computer and my Doc Marten boots. (Husband is in NY. Horses are being evacuated by my trainer.)" Pop star Iggy Azalea also tweeted Friday afternoon, "I am genuinely concerned about my home burning down it’s right on the Calabasas and I can’t get home to any of my things right now." Three fires broke out in the state yesterday. According to CNN, 30,000 homes were "under threat" from the Woolsey Fire that spread in Los Angeles and Ventura counties. The Hill Fire also broke out in Santa Rosa and reportedly covered 10,000 acres. In addition, there was a third Camp Fire in Butte County, which reportedly caused more than 40,000 people to evacuate.